I got to the sketchcrawl early to scope out a view, but it wasn't until Steven Reddy pointed me in the direction of an upstairs view--once I saw it for myself, I knew I had to attempt this. As usual, I get about 10 minutes into these complicated views and ask myself, "What was I thinking???" But I plow ahead and hope for the best. This is the initial blocking out of the sketch--can you guess what vertical corner I drew first? ended up on the back of my hand, so it all got a little too gray and murky! Got very dark in the space too, so while I painted 95% at this spot, I did take it outside near a window to add the last bits...while I sipped a green tea latte next to Sunil's talented family of sketchers! Click on this view to see it larger! You can also find a 50% off discount link on my website for my Craftsy course, "Perspective for Sketchers"...Craftsy offers several really great classes taught by a cadre of familiar Urban Sketchers. And finally, I'm also very, very honored to be teaching in Manchester at the symposium this July! Hooray!!! 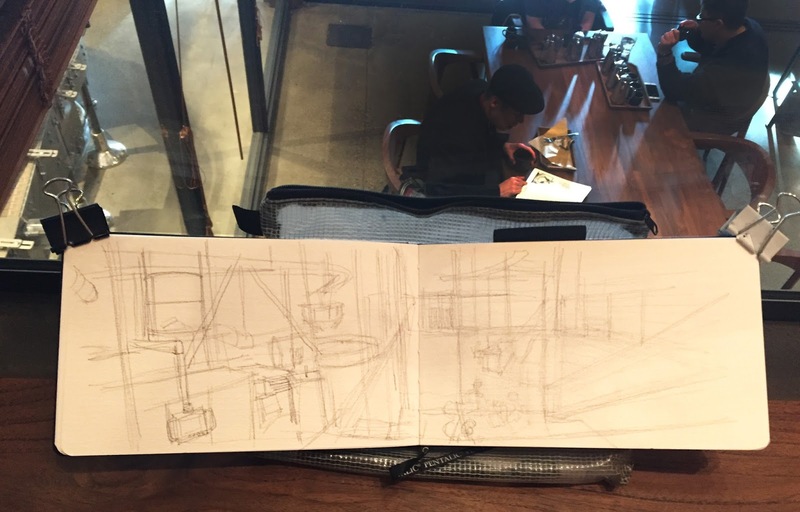 Amazing sketch of a unique Roastery view! See you in Manchester! Thank you, Tina...see you there!! And ouch, the air fares are insane right now!! !